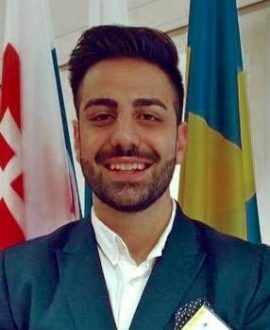 Say hello to Arash Bolouri, the representative of our umbrella organization, the Swedish Association of International Affairs (SAIA). Congrats on your new position as Vice President of the Swedish Association of International Affairs! Tell us a little bit about what your tasks as Vice President will be and what it was that made you want to represent SAIA at first? Arash: I want to sincerely thank the electoral meeting of 2017 in Örebro for electing me as the next Vice President of SAIA. I am humbled by the confidence that I will be able to lead and represent our members in the presidium. As Vice President I will do my very outmost to support the President in the management of the presidium and the national board. There are a lot of tasks that I would like to mention here, but to be short I will present a few tasks. During my mandate period I will act as contact person for the projects managers and the member associations. I will also assist the project managers/member associations in the work, if necessary. To answer the question of why I want to represent SAIA, I would like to emphasize that I am proud and honoured to be part of this association. Since foreign affairs have played a great role in my life and many others, I know how much the knowledge of foreign affairs is vital for the foundation of society as a whole and because of that, I am mostly dedicated to the purpose of this organization along with the participation of all the members and associates. What is the most important international issue at the moment, in your opinion? I would probably say lack of democracy. Without democracy, it will be difficult to deal with other issues that challenge both human beings and our planet. In regions that lack democratic rights and institutions, resources are spent on warfare and sultan palaces, while the population in that same region cannot afford medicine for their children. On the other hand, we can see undemocratic movements emerge in regions with the most developed democratic institutions and rights. I am aware of that I present a simplified picture of today’s reality. However, my point is that we should on an international level focus on subjects that threaten democracy. If you could find out anything you wanted just by asking – Who would you ask and what would the question be? The question would be: How can we create an everlasting peace on the planet? However, I do not know who I would ask. Tell us about a secret talent of yours? That was a difficult question! Hmm… I always strive to make others feel comfortable, that’s probably why I smile often. Maybe that’s my secret talent?